Spring definitely arrived in April, suddenly everything was green and the lanes narrowed as Jack in the hedge and the cow parsley suddenly shot up. The swallows returned and some are now nesting over Buttermere where the hayloft was once accessed and others are noisily considering the archway by Loweswater. The clematis in the courtyard is an apartment block with wagtails and blackbirds nesting at different levels. Last year, I had a swallow who decided that the bird he most wanted to impress was the one he could see reflected in my front door window. He perched on the window panes singing such a beautiful song every day that I came to recognise it. The other day I was out gardening and I thought I heard his unmistakable song again, and when I went to look, there he was back on my window panes! It was lovely to see him but it seems a bit sad that he went all the way to Africa only to return to his reflection! I hope he will soon find a bird who is more responsive! I heard the first cuckoo in Lanthwaite Woods on Easter Sunday (April 24th) and it was whilst I was sitting in the garden listening, that a chaffinch came and landed on my head on its way to the feeder – never had that happen before! And whilst I am still thinking about birds, the ospreys are back at Bassenthwaite and have been seen over Crummock on a couple of occasions – great excitement. April was dry and quite sunny and the Rannerdale bluebells started to flower very early: they were making quite a show by the end of the month and smelled gorgeous. I always think it is interesting the way flowers vary each year. This year the snowdrops were lovely and lasted for a long time but the daffodils seemed to be very short-lived. The primroses have lasted well and there was a good show in the woods behind Foulsyke. What has been really superb this year are the violets, lots of them in the hedges and woods and even on the open fells. 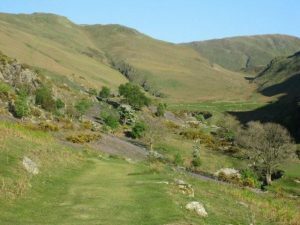 All the lovely weather has of course been excellent for walking and with the longer days you can go for longer walks! 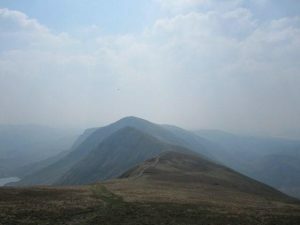 My friend Judy and I did the Kentmere Horseshoe the other week: it was a splendid walk, a bit hazy but still very beautiful. As it has been so dry it was also a good opportunity to do some of the boggier fells so Ullscarf was conquered with dry boots! Finally I would like to include two beautiful pictures of ‘the view’ taken by my neighbour, John Thompson, who many of you will know.